Near the end of class we actually went inside, but then we all had to sit for our class photo. A couple of my classmates just wouldn’t sit still…Mom tells me I’m not very good at the sit stays…but boy was she proud…even through all the barking & mayhem I held my sit…I sure wasn’t enjoying myself but I held it. 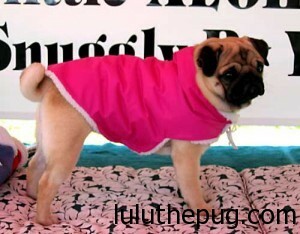 When I finally got to go back to mom she whispered “good girl” at me…but then she put that stupid pink thing back on me! I DO NOT LIKE IT…but I guess I don’t like the cold either. Hmph! 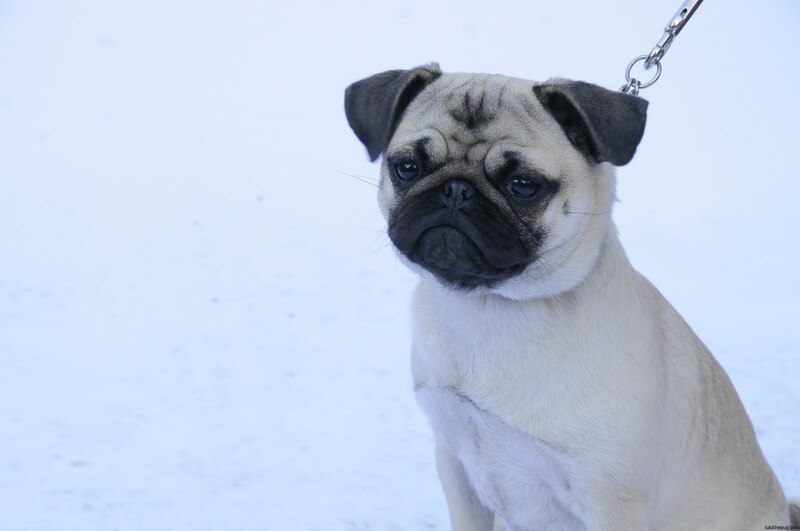 My Dad took me to a “casting call” today…there were SO many dogs there. They were mostly all QUITE mis-behaved!! I didn’t really enjoy myself but I CERTAINLY was better behaved than those “OTHER” dogs!! When we got home I heard my Dad tell my Mom that I looked a bit thick around the neck in the photos…do I have a fat neck? Eeek..! I feel so self-conscious now!$%!”@! 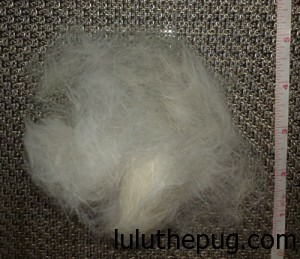 I knew that we pugs shed a lot…but I didn’t know we shed A LOT!!! My mom has a lot of black clothes, and a whole rail in the closet full of LBDs (little black dresses), but I’ve come to realize virtually all of her clothes are black, or at least dark enough to show EVERY LITTLE STRAND of my pug fur. How do I hide something so well in the house that after a week of my mom & dad crawling around they still can’t find it anywhere? They keep asking, “How does she do that?” I’m good! My mom learned in class a couple of weeks ago that giving me rawhide chews/bones is verboten (boo!) so they bought me a small elk antler for $10 and today I had it in my mouth one second, and the next it’s gone…where did it go? They’ll never find it…haha! 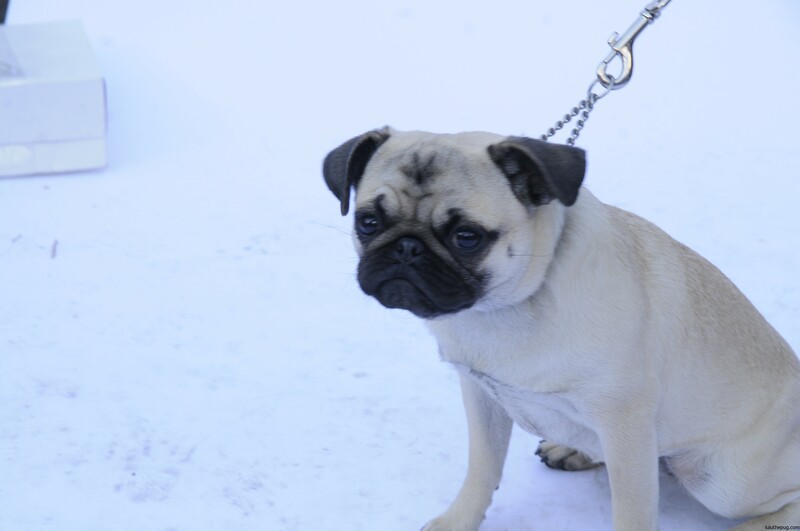 We watched Milo & Otis…none of us had seen it before…so I thought it was time to see a few “pug” movies. It was such a sweet little movie. I got QUITE worked up a few times…especially when Otis was frolicking! My mom says she’s not quite sure what to do about Ms. Pug’s (that would be me apparently!) barking….I like to bark most when I’m in the backyard…squirrels, birds, falling leaves, neighbours…so many things to bark at…sigh…She says she doesn’t want it to keep getting worse… At least I don’t bark at dogs, people, squirrels or birds when we’re out walking – I like to save it all up for when she’s in the backyard. don’t leave me in the car either…! For the first 20 minutes of training class this morning we had to leave our dogs in the car. I had never left Lulu in the car for more than about 2.5 minutes before so she was a tad incensed. This evening we went grocery shopping and decided to bring her with us. A quickish trip into Costco (as quick as that can ever be), a quick trip into Superstore, and then brought the poopsie into Petland to buy her some Orijen puppy food and a deer antler (didn’t know until one of the classes last week that rawhide was a total no-no). Lulu whimpered almost the entire car ride home…not sure if she was excited or upset…surely she has to enjoy being in the car with us more than being locked in her crate at home? For the last couple of months I’ve been in the habit of tossing a kong filled with peanut butter into Lulu’s crate before exiting the house so she’s occupied and doesn’t watch me leave. This morning I put half a dental bone thingie in there and she was scratching, and BARKING, and whimpering before I even got out the door. Good grief that’s a heart wrenching sound. Yikes…if I could find a way to get paid to play with lulu all day I’d be a very happy puppy-mommy! there’s a traffic jam where? Without fail, when we’re watching the morning news Lulu starts barking during the traffic report. Every day…good traffic, bad traffic, Lulu’s going to bark at it. 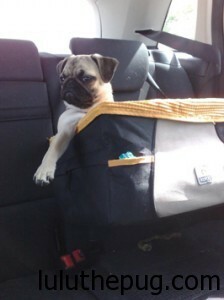 It’s quite cute…she does NOT enjoy the traffic…RRRUFFF!